This year I am making all of my Thanksgiving dishes in advance. We are just about ready to move into our new house so cooking a large meal all at once in our messy, half packed kitchen is not totally plausible. I’ve actually really been enjoying cooking dishes one by one. I am able to better focus on the recipe, it’s a lot less stressful AND I get to share everything with you guys far in advance so that you can prepare for your meal as well! I will be sharing a few more Thanksgiving recipes before the big day and I might release some exclusively for my email list, so if you’re not already signed up, I highly recommend doing so in the next day or two! 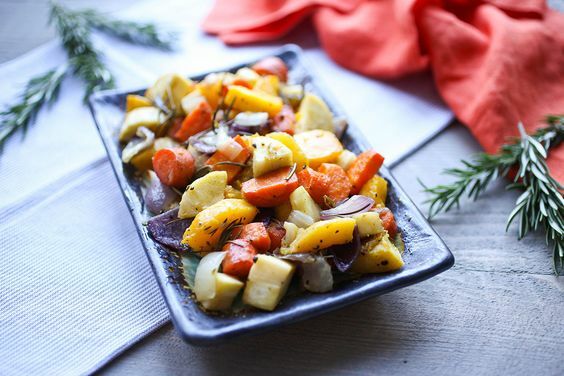 Roasted vegetables is one of the easiest, most quintessential fall dishes and I have been preparing roasted veggies for Thanksgiving for as long as I can remember. 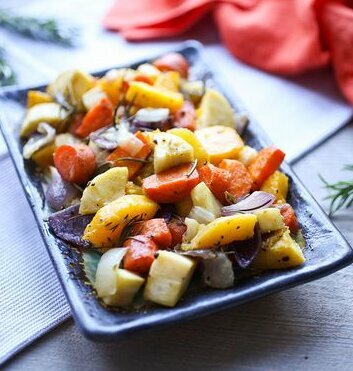 The best part about roasted vegetables is that experimenting with new and different ingredients is always very simple and exciting. For example, some years I’ve included things like peppers, other years I add in things like eggplant or brussels sprouts. This year, mainly because I could not find organic brussels sprouts no matter how hard I looked, I decided to stick exclusively to winter squash and root vegetables. The result is a rich, flavorful and elegant dish, perfect for any fall holiday table. If you can’t find some of these veggies, don’t worry. Just use the ones you can, pick some additional ones you like and experiment! The result should turn out wonderfully either way. Make sure you chop your vegetables to relatively the same size so that they cook evenly and don’t burn. 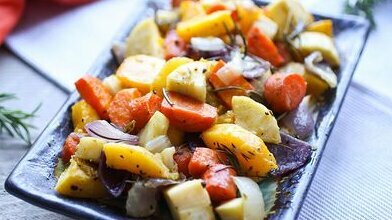 Place all equally sized chopped vegetables in a large oven-safe baking dish and mix together. On top of vegetables, de-stem rosemary and thyme and sprinkle on top. Pour 3 tablespoons of olive oil over veggies and herbs and top with salt and pepper, to taste. Mix all ingredients together. If you sense that you don't have enough herbs or olive oil, free free to add more. Place your dish in the oven and cook for 20-40 minutes depending on your oven and remember to mix every 10 minutes to make sure all vegetables are cooked evenly. Remove from oven when vegetables are tender and golden brown.